Math Mammoth Grade 4, South African Version is a complete maths program for 4th grade. It consists of two student worktexts (A and B), a separate answer key for each worktext, tests, mixed revisions, and in the download version, an additional worksheet maker (Internet access required) to make extra practice worksheets when needed. The year starts out with a revision of addition and subtraction, patterns, and graphs. We illustrate word problems with bar diagrams and study finding missing addends, which teaches algebraic thinking. Children also learn addition and subtraction terminology, the order of operations, and statistical graphs. Next come large numbers—up to millions, and the place value concept. At first the student revisions thousands and some mental maths with them. Next are presented numbers up to one million, calculations with them, the concept of place value and comparing. In the end of the chapter we find out more about millions and an introduction to multiples of 10, 100, and 1 000. Please note that the curriculum is not following the South African official syllabus for 4th grade maths. 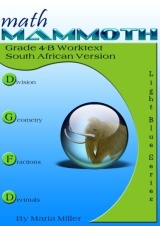 Instead, it simply is a copy of the US version of Math Mammoth Grade 4. For the most part, Math Mammoth exceeds South African standards. Some standards may not be covered. Fraction manipulatives. The curriculum contains printables to make your own fraction manipulatives. The text uses visual pie models extensively, and students even learn to draw them for themselves for the exercises, therefore making or buying the manipulatives is entirely optional (optional; for 4-B).